When you think of Weber State, Damian Lillard is the first guy that comes to mind. He already has a Big Sky Conference MVP Award under his belt, and he will be one of (if not the) favorites to win it again this year. But if you think all of Weber's success is because of him, you would be wrong. Last year, though he got hurt before conference play began, the Wildcats still finished 11-5 in the Conference. 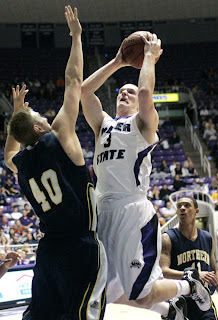 One of the big reasons for that was Kyle Bullinger, who was an all Big Sky performer last season. Bullinger is 6'6'' but more forward than guard for Randy Rahe. He averaged 11.1 PPG and 6.2 RPG, but is even better than his numbers suggest. For one, he is an excellent rebounder, posting a 21.2 DR%, 126th in the country (and 3rd in the Big Sky last season). Offensively, he can hurt you in different ways. He is potent from the outside (a theme for the Wildcats), as he shot a solid 42.9% from downtown last year, making 54/126. He is also adept at getting to the line, shooting103 FTs last year with a solid 39.3 FT Rate. He made about 69% of the attempts, which isn't great, but solid. And he shoots 46.3% from 2s, which again, not bad. Add it all up, and his EFG% is 55.0, which was 7th in the Big Sky. Putting it all together, and Damian Lillard is certainly the star for Weber State, but he is not the only one. One of the reasons why Weber State is going to be picked to do so well is guys like Kyle Bullinger... they might not get a lot of press, they'll never make it in the NBA, but they are excellent college players at the mid-major level.